The Link Between Hammertoes and Shoes | Podiatry Associates, P.C. With the New Year right around the corner, people are gearing up for parties. This means planning food, decorating, and of course, finding the right shoes for the occasion. 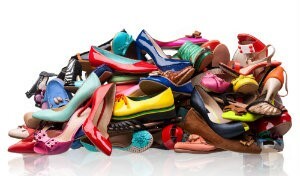 For many fashion-conscious shoe-lovers, this means bringing a pair of holiday high heels to wear. Pumps of all kinds are a fancy dress staple. Unfortunately, they can also be a form or torture for foot problems, no matter how cute they are. This is especially the case for hammertoes. Hammertoes are deformities that develop when the tendons that keep your little toes straight become unbalanced. The affected toe becomes stuck in a bent position at the middle joint, which can push your digit painfully downward. Because high heels force your bodyweight forward and put an abnormal amount of pressure on the ball of your foot, they make developing a hammertoe more likely, or worsen an existing one. The best way to treat a hammertoe or prevent one from forming is to avoid wearing pumps. Stick to holiday dress shoes with a low heel, padded sole, and wide toe box for your digits. The deeper the toe box, the better, too, since this will keep the top of your shoe from rubbing against the tops of your digits and possibly giving your hammertoe a blister or callus. Go wide – Look for pumps with wide toe boxes that won’t pinch. Stay low – Stick to heels two inches or lower to avoid stressing your forefoot. Cushion well – Insert a cushioned insole or metatarsal pad into your pumps to alleviate pressure. Padding the hammertoe’s bent joint may prevent blisters, too. Stretch out – Stretch your feet before and after wearing high heels. Limit your time – Don’t wear your heels for too long. The more you invest in your feet now, the better it will be for them in the long run. Don’t take a hammertoe for granted. If you’re suffering with toe pain, wear the right shoes and have your feet checked right away. Our team at Podiatry Associates, P.C. can help. Make an appointment online, or call (303) 805-5156 for our Castle Pines, Parker, and Cherry Creek, CO, offices.